We talk to the producer of Tales at Comic-Con in New York. At Comic-Con in New York this weekend, we had the chance to sit down with Tales series’ producer Hideo Baba, there promoting the upcoming Tales of Xillia 2 and Tales of Symphonia Chronicles. During our interview, Baba-san discusses Xillia 2‘s reason for creation and main character, Tales series localization efforts, Kickstarter, and more. Read the full thing below. —Tales of Xillia is the third mothership Tales game to receive a sequel since the series started in 1995. What was it about Xillia that called for a sequel? Baba: Tales of Xillia 1 is the 15th anniversary title. When we were developing Tales of Xillia, we didn’t have any plans to make a sequel. But the 15th anniversary is a special title, and we made a very detailed history set in the Tales of Xillia world. This includes many pieces not described in Tales of Xillia. So we decided to describe those pieces, not described in the first game, in Tales of Xillia 2. In Tales of Xillia, there are two worlds. The first world is Rieze Maxia, the world that acts as the main stage in Tales of Xillia. Then the second world, which is called Elympios, was not portrayed as deeply in Tales of Xillia 1, so we decided to make it the main stage in Tales of Xillia 2. —Tell me a bit about the new protagonist of Tales of Xillia 2. Baba: The new main character for Tales of Xillia 2 is Ludger—the guy at the center of that poster over there. The story will be developed from his perspective, and he will need to make many choices to proceed with the storyline. 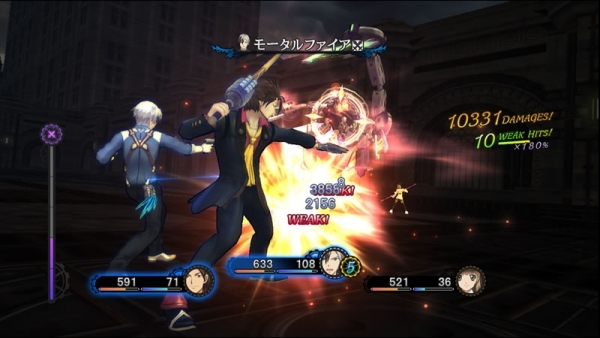 Originally, his character is not very unique or standing out, but players will act as Ludger himself, and by selecting so many choices, these activities will develop Ludger—depending on the choices the players selected. —Outside of Tales of Xillia 2‘s choice element, which new element do you consider to be most significant? Baba: It’s not a game mechanic, but the world setting in Tales of Xillia 2 is very different from all the previous titles. The world is a kind of modern and futuristic city. You can compare the previous games’ worlds as something of fantasy. But regarding the game mechanics, the battle system is based on the original Tales of Xillia, so you can use Link Artes, and such. But at the same time, Ludger can switch between weapons during battles. But I think the world it’s set in is the most significant change from the previous titles. —Can you give me an update on the potential of Japanese voice-overs in Tales of Xillia 2? Baba: We haven’t decided yet to include Japanese voice-overs in Tales of Xillia 2, because there are many problems with implementing it in the localized version. With Tales of Symphonia Chronicles, we can finally include Japanese voice-overs. But the original game was released 10 years ago, so it took a very long time do this. So it seems a bit difficult with Tales of Xillia 2. —In Japan, you recently announced a slew of new Tales smartphone games. You’ve got Tales of Link, Tales of Bibliotheca, Tales of Phantasia, and just this week you released a Tales of Hearts R port. How important are smartphones becoming to the Tales series? Baba: One of the biggest reasons why we release so many titles on iOS or Android is that these titles are not for the loyal users, but for the casual player who might have interest in the series, but hasn’t played the series before. These titles are easy to pick up. Regarding Tales of Phantasia, it has been released and ported to so many consoles and handhelds, and iOS was another opportunity. —I’m sure you’ve heard of the #JRPGVita movement on Twitter. Many of these requests have been for the PS Vita Tales games. Are there any updates on their localization? Baba: I have received so many requests about the PS Vita Tales of titles from fans. But, as of now, I don’t have any specific plans to release those titles in western countries. —Have you ever considered platforms such as Kickstarter to fund localization? Baba: As you know, the Tales of series is one of Namco Bandai Games’ most important franchises. Basically, we like to develop games within our own budgets. That said, we don’t have any plans to launch a Kickstarter and ask for money from the fans. —Being the producer of the Tales series, your credentials largely consist of Tales games. But among them are Death by Degrees, the PlayStation 3 version of Eternal Sonata, and most recently Blue Dragon: Awakened Shadow. Do you see yourself ever taking a break from Tales to create a non-Tales RPG? Baba: When I started developing Eternal Sonata, I was excited to develop a new RPG, and I was glad to develop Blue Dragon with Sakaguchi-san. I really love RPGs, and I love the Tales of series, of course. But I have a kind of dream, not a plan, to develop an open-world RPG like Skyrim or Dragon’s Dogma—but I don’t have any specific plans. —So you’re working on the next Tales game. You previously told me you’re sticking to PlayStation because that’s where the fan base is. Is it safe to expect the next Tales game on PlayStation 3, then? Or is it possible you’re trying out something on PlayStation 4? Baba: As I said before in our previous interview, our basic strategy is to release Tales of titles on consoles that most of the users want to play on. So I cannot say the specific name of the console, but please… guess! —Is the next game called Tales of Zestiria? Baba: (Laughs) While developing the games, we come up with so many ideas for the title, but to use that title, we need to trademark it. That title is one of our ideas, but nothing has been decided yet regarding the title. —I’d like your brief thoughts on next-generation consoles. Is there anything specific about PlayStation 4 or Xbox One that appeals to you? Baba: We don’t have any specific plans to release titles on next-generation consoles. But the next-generation consoles have much higher specs, and there is much bigger potential with those consoles. In the future, the time will come to release a title on a next-generation console, so we are looking forward to seeing its potential. —Any games coming to PlayStation 4 or Xbox One that you’re looking forward to? —You’ve previously said you want to shorten the gap between the latest Tales games’ Japanese and western release dates. You’re already showing this with Tales of Symphonia Chronicles, where the separation is just a few months. Do you see a future where completely new entries see the same treatment? Baba: As you know, Japanese RPGs have a lot of text, so it always takes a very long time to not only localize Japanese to English, but to French, Italian, German, and the European languages. But I really understand that fans want to have the game as soon as possible after the Japanese release, so we are constantly looking at how to assign staff to shorten the gap between the Japanese and western releases. Usually, it takes one or a year and a half to release a western version title after the Japanese version releases. But we are really trying hard to shorten that gap. —How do you plan to continue innovating the Tales series in the future? I’m sure you have many ideas in your head. Baba: I think a good example is the battle system in the Tales of series. I really want to provide new gameplay experiences for fans in each title, so users can have some expectations on new battle systems in future titles. But while we keep tweaking the battle system, I want to keep thinking that the storyline and characters in the series are very important. —What inspires you to create each Tales game? Baba: My biggest purpose in developing new Tales games are to move fans with the storyline, and I hope the storyline and the characters can encourage the players. —I guess what I’m trying to say is, is there something specific that inspires you to create the storylines you create? —Are you saying these books inspired the latest title? Baba: It’s not like there was a direct inspiration, but it influences my way of thinking, for example, when coming up with characters, the story, those concepts and keywords, and message I want to get across. —Can you share a final message for the fans? Baba: I’m really glad to come back to New York Comic-Con again, and I really had a good time with the fans at the panel last night. I’m really glad that so many fans come to New York Comic-Con to see me and have a really good time with the team. I’m impressed that at New York Comic-Con there are so many passionate fans and that the Tales of series is accepted by them. Over the next year, Tales of Symphonia Chronicles and Tales of Xillia 2 will be coming to North America, so I hope the fans can stay tuned. —Thank you, Baba-san. It was great seeing you again!